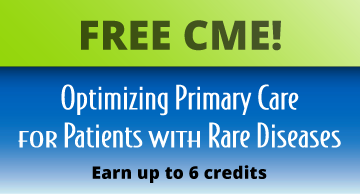 Rare Opportunities in Primary Care is committed to enhancing primary care for patients with rare diseases. Won’t you join our efforts? 1. ACCORD. Rare disease management survey. Ramsey, NJ; 2015. 2. Global Genes. Rare diseases: facts and statistics. https://globalgenes.org/rare-diseases-facts-statistics/. Published 2015. Accessed May 10, 2016. Which complex conditions do you find most challenging? A cheerleader and competitive dancer, Grace W.* wasn’t prepared to get sidelined when she was first struck with pain in her ears and sinuses at age 17. Diagnosed with otitis media and sinusitis, she was prescribed a series of 3 antibiotics over the next few weeks. The first antibiotic did not improve her symptoms, and she was switched off the second because of suspected dermatitis; she did not respond to the third antibiotic either. Before long, Grace developed pneumonia-like symptoms; she eventually was admitted to a local community hospital when she began to bleed from her nose and ears. Over the course of about 10 days, Grace went into organ failure, and the hospital staff told her family that she did not have much longer to live.